Under the desk pedal products are available from several manufacturers with different styles, options and weights. I will say right now – cheap isn’t best. 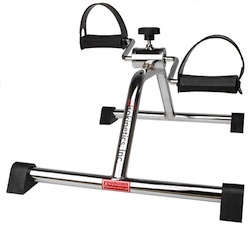 Keep in mind that these desk pedal exercisers are lightweight for portability and ease of use. That being the case if the grips aren’t solid they will just slide all over the place during use. When looking at purchasing one of the under desk bike pedals look for something with good solid construction and the ability to alter the resistance. 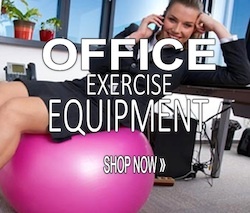 Usually these are versatile and you can place the pedal exerciser under desk to use with your feet. Adjust the tension so you are getting some resistance. Or you can place the pedal exerciser on top of the desk and use your hands and arms for an upper body workout. Finding ways to exercise at work does several great things for you. First exercise helps to keep you alert, has proven to improve brain function and will help your digestive system, increase your metabolism and build strength and stamina. Second, you get to do all these great things on the bosses paycheque. It doesn’t get much better than that does it? If you are like so many knowledge workers out there and chained to your desk all day then consider doing some exercises while at work. … this pedal machine may be a feasible tool for reducing sedentary time while at work. For small pieces of equipment you can use portable exercise equipment like bands, stability balls, or an under desk pedal exerciser. If no one in your office has approached the boss on this yet maybe its time. 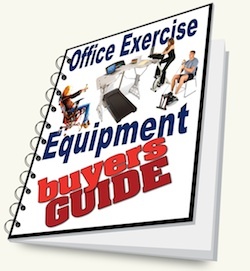 This under desk exercise equipment and others have been increasing popularity with business owners and management so much so that they are buying them for their employees!